Yes, I would like an expert from Thermo Fisher Scientific to contact me. Yes, I would like a demo from Thermo Fisher Scientific. Yes, I would like a quote from Thermo Fisher Scientific. Yes, I currently have funding. Proteomics techniques are rapidly evolving to become a highly sensitive, quantitative, and high-throughput approach to analyzing global protein dynamics within a cell, tissue or an organism. The ability to perform accurate protein quantification at low levels lets scientists unravel the complexity of protein interactions and track abundance changes in a variety of targets. When combined with multiplexing capabilities that allow scientists to measure increasing numbers of samples across varying conditions in a single experiment, quantitative proteomics provides a better understanding of the molecular mechanisms underlying biological processes and disease states. 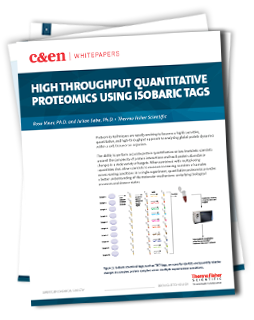 This whitepaper discusses critical advances in analytical technology driving this revolution in proteomic analysis, allowing biologists to explore the proteome at greater depth, measure changes in protein localization and quantify minute changes in low abundance proteins. Furthermore, four leading researchers discuss the use of tandem mass tag (TMT) multiplexing enabled by Synchronous Precursor Selection (SPS) MS3, and how it has facilitated groundbreaking discoveries in each area of their research.